ADP, a global provider of human capital management software, has partnered with three multibillion-dollar tech companies – Microsoft, Slack, and Facebook – to integrate HR tech solutions into their respective platforms. Microsoft will offer clients ADP Workforce Now through the all-in-one management system of Microsoft Dynamics 365 Business Central. The platform is built for streamlining operations, finances, sales, and customer service. The cloud-based platform is designed to help HR teams handle talent, employee data, time and attendance monitoring, payroll, taxes, and benefits, as well as other business processes. Days before the Microsoft partnership was announced, the HCM specialist also joined forces with team collaboration software company Slack to give customers access to their HR and payroll data through the Slack ecosystem. Employees of clients who deploy ADP’s application programming interface will receive details, such as time-off and pay notifications, and can take action on the items all within Slack. “ADP’s integration with Slack is already putting HR and payroll information where employees are working, and is enabling our mutual clients to maximize productivity and workforce agility,” said Don Weinstein, chief strategy officer at ADP. 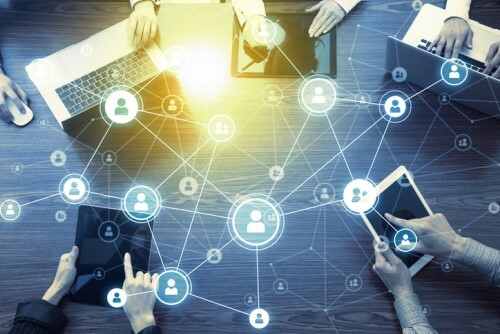 In May, ADP rolled out a virtual assistant via the ecosystem of Workplace by Facebook, the social media company’s enterprise platform. Much like the Slack integration, the ADP Virtual Assistant delivers HR and payroll functions within Facebook’s team collaboration site. Once a client deploys the ADP Virtual Assistant, employees can opt in and install the chatbot, which will then provide HR-related information through the chat interface. Users can access pay and time-off details from any device that supports Workplace by Facebook. Push notifications can also be set up to alert employees on payments.